Verve Logic is a leading VPS provider. You get reliable and secure VPS hosting from Verve Logic. We offer VPS hosting with great affordable prices from the market. 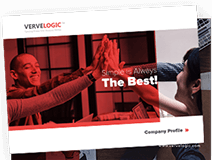 Verve Logic Managed VPS hosting packages are cost effective substitute for shared/reseller hosting which gives the power and flexibility of a dedicated server without the high price tag. VPS’s are best for high performance web application that demand more resources than a shared environment. Click here → http://domain.vervelogic.com/vps-hosting.php to see our VPS packages!